The days of swinging a big iron ball are long gone, demolition these days is more like deconstruction. A long arm excavator with a powerful claw pulls the building apart, and then places all the material for recycling into big piles or straight into trucks. It does make for slow progress though, especially when there is only one doing the work. A dry dusty July day meant that large clouds of dust were thrown up when an artic arrived on site to haul away the scrap. 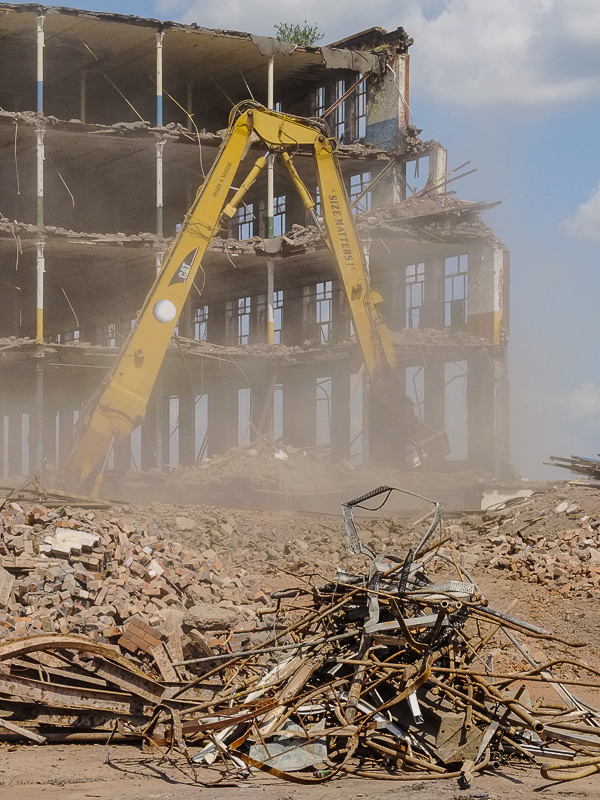 I captured a few of the excavator through the dust – it seemed quite symbolic of the destruction and mayhem that were being wreaked on the site. These mills always look so solid and built forever, until you rip the side from one and then they look quite fragile. Yes those iron columns seem so insignificant in such a huge structure, but cast iron has good compressive strength so is excellent for load bearing in situations like this, especially when you consider the Victorian tendency to over-engineer things! Is there not some legislation or whatever about having to use dust suppressing water sprays. I observed this being used during the demolition of Facit Mill in Whitworth last year. You say your memories go back to swinging balls, my memories of the late fifties and early sixties often involved burly men swinging very large hammers. At the demolition of the Royton Spinning Co’s mill a man was seen several storeys up attacking the floor between his out stretched legs! Not sure about legislation, but I’ve certainly seen sprays being used during and after explosive demolitions of flats and chimneys etc, probably becase you get a huge amount of dust in one go, and it’s easier and cheaper to deploy sprays over a couple of hours, rather than all day over several weeks. The slow progress on demolition, combined with the uncharacteristically dry summer, has meant a lot of dust over a long period of time unfortunately. Whilst on the subject of Mill demolitions I observed last year at the clearance of both the Oak and Dane Mills in Rochdale that bricks were being sorted and palletised. This has also been happening at the Spotland New Mill in clearance of ancillary buildings. The demand though seems to be restricted to the ‘brown’ type of brick.